IRVINE, Calif., April 22, 2016 /PRNewswire/ — Significantly larger numbers of electric fuel-cell cars will go on sale in California this year following decades of hard work by thousands of automotive engineers, policymakers, and government-agency personnel. The simultaneous launch of the True Zero (www.truezero.com) Network, a series of hydrogen-charge stations being established by start-up FirstElement Fuel Inc. (www.firstelementfuel.com), will help eliminate the major roadblock facing these types of cars: anxiety over finding a reliable place to charge. 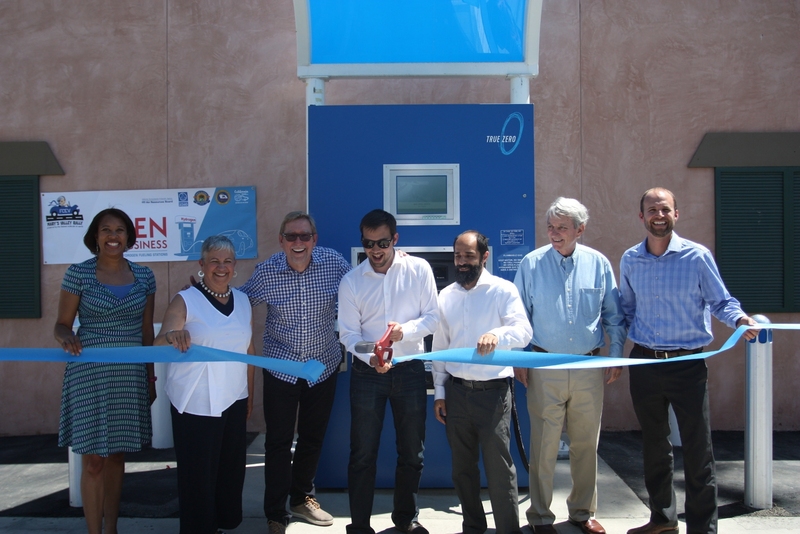 Helping to cut the ribbon (April 21st) at the recently opened True Zero hydrogen-fuel station in the San Joaquin Valley are (from l): Commissioner Janea Scott of the California Energy Commission; Mary Nichols, Chair of the California Air Resources Board; Joel Ewanick, CEO of First Element Fuel, True Zero’s parent; Dr. Shane Stephens, First Element CDO; Ghassan Sleiman, First Element VP; John Harris, owner of Harris Ranch Co. and Tyson Eckerle, Deputy Dir. for ZEV Infrastructure, Office of Gov. Jerry Brown. The first 15 True Zero stations (photos at www.truezero.com/images/) were brought online at an unprecedented speed and scale throughout Silicon Valley, the greater Los Angeles area, Lake Tahoe area, and Harris Ranch in the San Joaquin Valley. An additional four stations are expected to be online by year’s end. The projects are being funded in large part by grants from the California Energy Commission, South Coast AQMD and Bay Area AQMD, as well as partnerships with automotive firms Toyota and Honda who are first to market with fuel-cell electric vehicles. This network gives confidence to the hydrogen community that the industry can quickly bring on line the required stations to meet the demand and timing of the OEM’s. True Zero represents the world’s largest network of hydrogen-charge ports ready for retail consumers. Customers are now able to charge their vehicles at stations throughout California. This generation of electric vehicles powered by fuel cells will be able to travel more than 300 miles on a single charge and a “fill up” of True Zero will take four minutes or less. “So customers will be able to drive an electric fuel cell car seamlessly throughout California, through the San Joaquin Valley and out to Lake Tahoe, just like they drive a gasoline, car thanks to the True Zero Network,” added Ewanick. The brand name True Zero speaks to the benefit that fuel cell vehicles will achieve. As a fuel, hydrogen is similar to electricity in that it is produced from a variety of sources. In California one third of the hydrogen produced today comes from renewable sources, with the remaining two thirds incorporating natural gas and water. An electric vehicle powered by hydrogen uses its fuel cell to convert the hydrogen into electricity to run the motor. The only emission coming from the vehicle is water. Once its 19 initial charging ports are completed, it is estimated the True Zero Network will have the capacity to replace 2.5 million gallons of gasoline with domestically sourced hydrogen and reduce CO2 emissions by 34 million pounds each year,* or the equivalent to planting a forest nearly the size of San Francisco.